CHARMS has been developed in the UK and is hosted in the UK on a private cloud in datacentres provided by our partner, UKFast. UKFast are ISO27001 accredited and work closely with our team at SCN to offer complete security for our customers. Data security is paramount and backups are only stored in the UK; our developers are all UK based and all our staff are enhanced DBS checked. The fastest growing CHARMS community is children's residential. 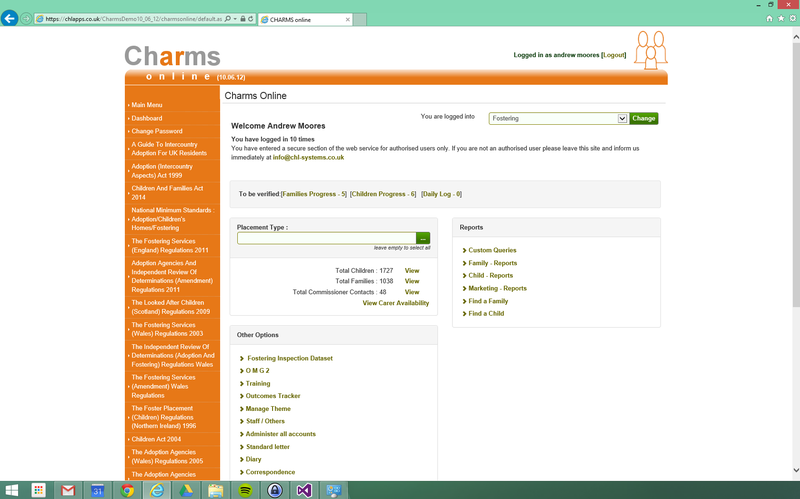 If you need a secure, online system to manage all the young people's case records look no further than CHARMS - it does all that you need. Care workers complete their logs quickly and easily; care home managers can see what is going on instantly; and now, young people looked after can keep their own recordings safe using the CHARMS Young People App. The Education and Adoption Act 2016 placed a responsibility on local authority adoption services and voluntary adoption agencies to work together to establish Regional Adoption Agencies (RAAs) in England. CHARMS has been the mainstay of the adoption community for 2 decades and is now the system of choice for 5 of the first group of RAAs. 30 of the 35 Voluntary Adoption Agencies in Wales, England and Scotland use CHARMS. CHARMS helps them all to make sure that sensitive case records are kept safe. SCN's dedicated supported employment system, ASSET, and CHARMS have now been merged and CHARMS offers the adult care community a unique, ground-breaking system to manage service user records in any care setting. Lancashire CC Shared Lives Service has been a fantastic user of CHARMS for many years and through their commitment to using secure, online records management system and their collaboration with our team at SCN we now have a system which can be help to save time across all providers. Services include supported employment, outreach, semi independence, residential care, mental health services and many more. Across the UK and Ireland some 250+ independent fostering providers and local authority fostering teams use CHARMS on a day to day basis to manage every aspect of the foster carer recruitment, training, assessment and approval process. Post approval, thousands of foster carers use CHARMS to record their daily logs and to communicate, securely, with their link worker. Young people looked after can also now login to CHARMS to keep their own "life story" and to share information with their carers and social workers. Panel members, assessors and all other stakeholders can login to CHARMS to access everything they need in the safest possible way. WHAT IS SOCIAL CARE NETWORK? Founded in 1996 by Jim Moores, a former Civil Servant and Local Government Officer, Social Care Network Solutions Limited (formerly CHL Systems Ltd) has established itself as one of the foremost providers of database systems in the care environment. For over 20 years SCN’s systems have provided the information tools for thousands of staff on the front line of social care. Every day, those same staff rely on our systems to manage caseload and to evidence the services they have provided to all groups of clients in the care sector. SCN is in the process of becoming a social enterprise.